SEASON PASSES ON SALE NOW FOR JUST $79.99 through April 15! Purchase your season pass now for the incredible price of just $79.99 plus tax! But hurry this sale price won’t last long. A season pass gives you laughing, splashing fun all summer long. What does your 2019 season pass include? 2 “Half Price Vouchers” to bring a friend, good any day the park is open. A $38 value! 2 “Bring a Friend for Free” select days! A $76 value! We’re happy to announce brand new cabanas for 2019 and the addition of canopies for smaller groups. Make your family day really special by adding a cabana or canopy rental. Enjoy privacy, shade, special furnishings and your place to call “home” for the day. Pictures will be added soon. Cabanas and canopies can be rented in advance by calling 270-781-7634 or at the ticket gate gift shop in the park. All cabanas are equipped with a dining table and four chairs, 2 chaise lounge chairs, a side table, a private locking box, complementary souvenir bottle ($10 value per bottle) for each member of your party (up to 6 bottles). You get $1 refills on your souvenir bottles all season long! Wristbands are required to occupy a cabana and each cabana comes with up to 8 wristbands. All Beech Bend Park rules apply to the cabanas, so you may not bring in any outside food or drinks. Cabanas operate on the same schedule as Splash Lagoon (please check our operating calendar for more information). There are no refunds on cabana rentals, including for inclement weather. All canopies are equipped with 2 chaise lounge chairs, a side table, and 2 complementary souvenir bottle ($10 value per bottle). You get $1 refills on your souvenir bottles all season long! Wristbands are required to occupy a canopy and each canopy comes with up to 4 wristbands. All Beech Bend Park rules apply to the canopies, so you may not bring in any outside food or drinks. Canopies operate on the same schedule as Splash Lagoon (please check our operating calendar for more information). There are no refunds on canopy rentals, including for inclement weather. Special School Field Trip Education Days Make Learning FUN! Special School Field Trip Education Days are available in early May and early June at the special school rate of just $19.99. Add a lunch ticket for just $4 more! A school field trip to Beech Bend Park is both educational and fun. We offer a special magic show promoting self-esteem and drug awareness and also can provide a Science Guide for students and teachers. Please call the Park office at 270-781-7634 for more information. Treat your Scouts and their families to a special day at a special price. Call Sherry Clouse at 270-779-5203 for more information. Exclusive camping deal for Boy & Girl Scouts! For more information, please call the campground office at 270-781-7634. In a ceremony held recently, the 19th annual Golden Ticket Awards were announced. The Golden Ticket Awards were presented by Amusement Today. Amusement Today is the world’s leading amusement park/water park business journal. The Golden Ticket Awards have become the industry’s most prestigious awards, equivalent to the “Oscar.” Beech Bend Park and Splash Lagoon’s “Cyclone Saucers” received high marks in the “Best New Water Park Ride” category. “Cyclone Saucers” tied for the No. 3 spot for the new water slide, the first of its kind in North or South America. “Cyclone Saucers” is part of a new four slide complex opened in 2016. Beech Bend’s Kentucky Rumbler was also ranked as the 48th Best Wooden Coaster in the world! “Hundreds of wooden coasters were considered for these awards. We knew we had a winner with the Kentucky Rumbler the very first time we rode it, but it is gratifying to know the rest of the world agrees,” commented Dallas Jones, park president. The Kentucky Rumbler has ranked in the Top 50 every year since it was built in 2006. The Kentucky Rumbler was built by Great Coasters International, Inc. Go to the Rides and Attractions page for fun coaster facts. History Making Splash Lagoon Expansion a Big Hit! BEECH BEND RAW – UNEDITED from Trevor George on Vimeo. Beech Bend Park’s largest water park expansion in park history is NOW OPEN. The multi-million dollar expansion includes Cyclone Saucers, the FIRST EVER North American installation of ProSlide’s FlyingSAUCER ride. 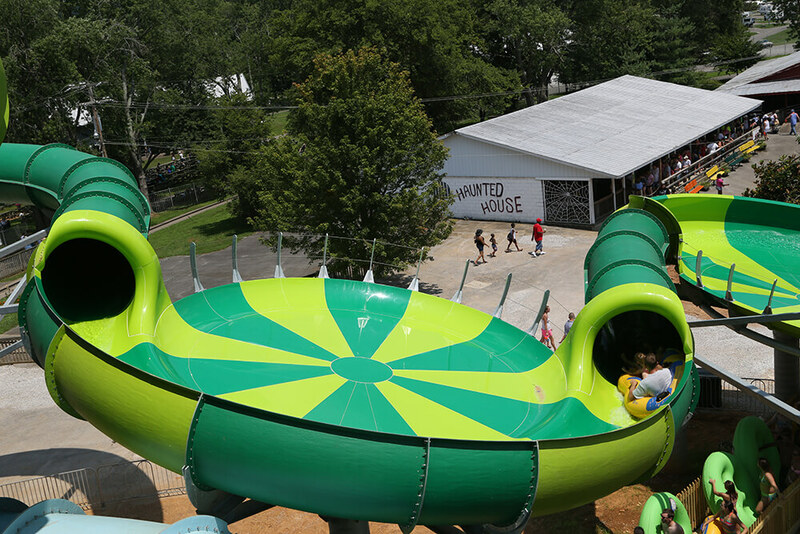 This history-making, ground breaking water slide will offer a very unique ride experience. Riders will fly around the edge of three “flying saucers” at high speeds. At nearly 500 feet long with a 55 foot elevation change, Cyclone Saucers is truly a one-of-a-kind experience.